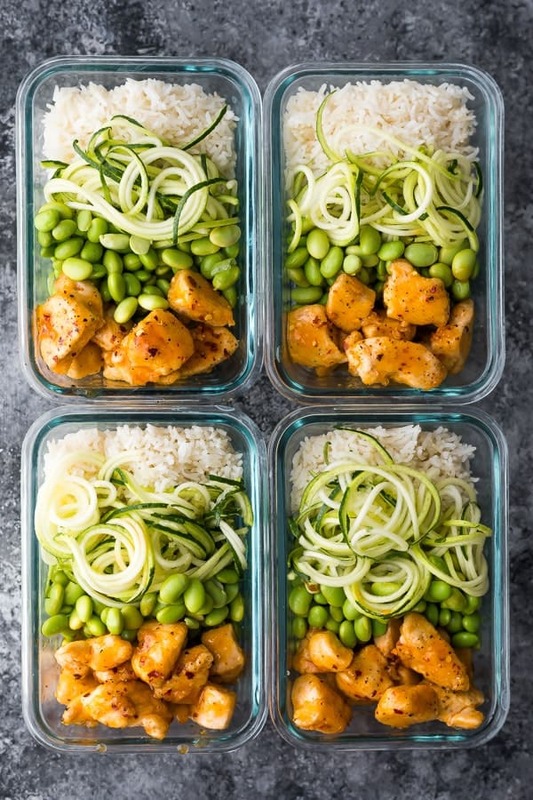 Healthier firecracker chicken meal prep bowls bring the spice to your lunch! Lightened up, but still super flavorful. Gluten-free and ready in 35 minutes. 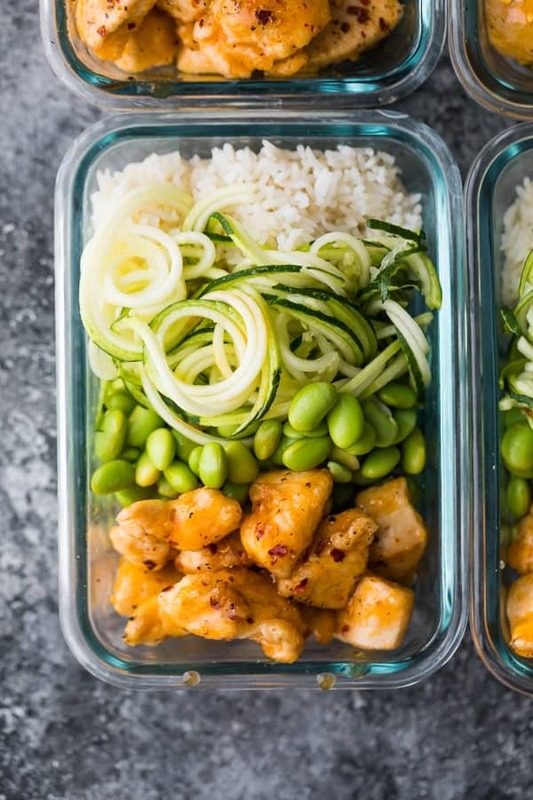 Bringing you another delicious meal prep lunch recipe, and this time we’re going take out fake out with this healthier firecracker chicken meal prep! If you know me, you know I love to mix it up when it comes to meal prep lunches…and we’ve had several delicious stir fry meal preps around here (check out this Sweet Chili Shrimp Stir Fry recipe I shared last week!). Today’s firecracker chicken recipe is not so much a stir fry, since we don’t actually cook our veggies. Instead we focus our efforts on the chicken, although really, it’s not much effort at all! 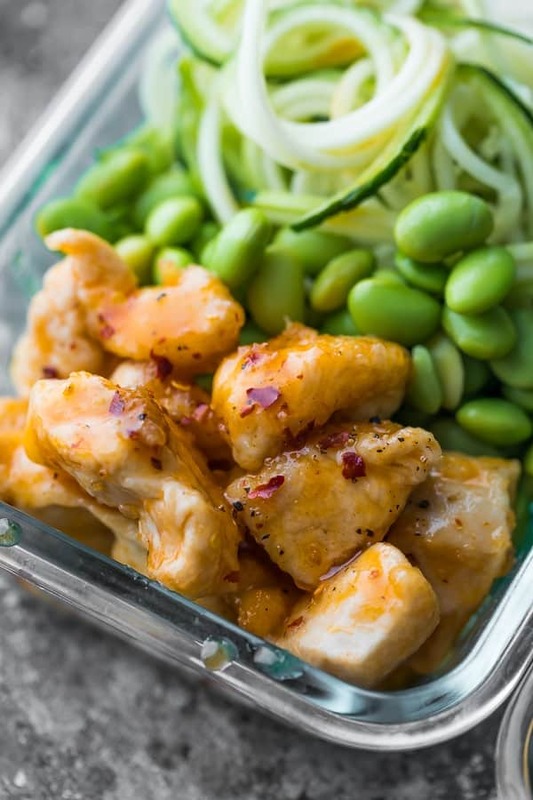 The resulting meal prep bowls are spicy, sweet, with a tangy twist, thanks to the apple cider vinegar in the firecracker chicken sauce. It is absolutely, most definitely a lunch I looked forward to!!! Most authentic firecracker chicken recipes dredge the chicken, fry the chicken, then bake it in the sauce. Well…ahem…I’m lazy, and ain’t no one got time for that effort on meal prep Sunday. So I made some easy shortcuts that probably alter the resulting chicken a bit, but honestly this was so tasty I didn’t care one bit! then we prep the THREE INGREDIENT firecracker chicken sauce: Frank’s red hot sauce, apple cider vinegar, and honey. Yes, it really is that easy! then we pan fry the chicken until it is almost cooked through, add our sauce, and simmer it until the sauce is thickened and chicken is cooked. How did I make this firecracker chicken version healthier? First? I cut the sauce in half. Even with the sauce halved, there is still plenty to flavor the chicken and mix in with the rest of the meal prep bowls. Second? I swapped the brown sugar for honey. Nothing against brown sugar, but anytime I can swap for an unrefined sugar, I go for it! Third? 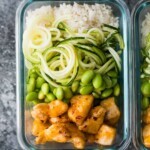 I served my firecracker chicken with zucchini noodles, edamame, and basmati rice. We need some healthy veggies and grains to fill our tummies and keep us full! swap the chicken breast for chicken thighs. The cook time may be 1-2 minutes longer, but chicken thighs keep even better than chicken breast in meal prep recipes! Shrimp and tofu would also be great in this recipe. you can swap the zucchini and edamame for any other veggie, but you will need to sautee things like bell peppers, snap peas, carrots, broccoli etc. Cook rice according to package directions, and portion out into four 2-cup capacity storage containers. Toss the chicken in the cornstarch. Use tongs to mix all the chicken cubes up and make sure they are all coated. Heat olive oil in a medium pan over medium heat. Add the chicken/cornstarch and season with salt & pepper. Cook for 5-7 minutes, until the chicken is golden and cooked through. 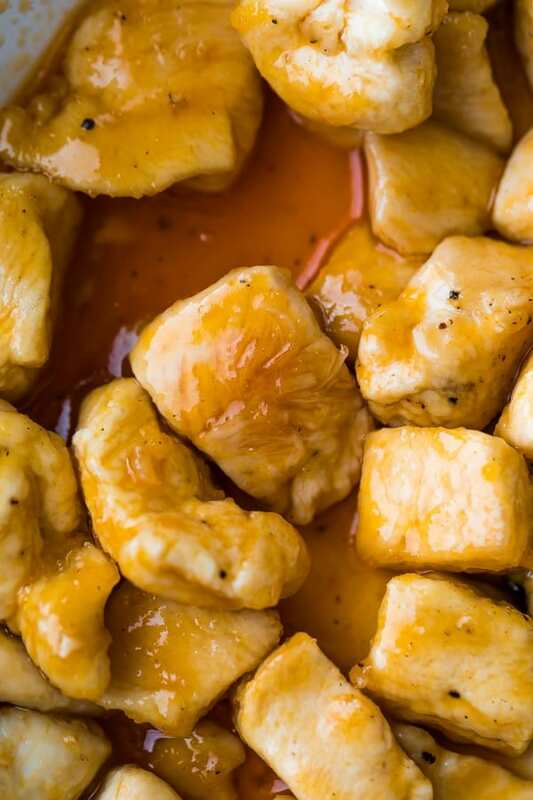 While chicken is cooking, shake together the honey, hot sauce and apple cider vinegar. When chicken is cooked through, pour the honey/hot sauce/cider vinegar mixture over everything and toss chicken to coat. Remove from heat when sauce has thickened slightly. Divide all ingredients between the storage containers. Drizzle chicken with any extra sauce from the pan, and sprinkle with red pepper flakes if desired (for extra heat). To serve, heat until piping hot, then enjoy! Lighten up this recipe by using cauliflower rice and/or replacing the edamame with more zucchini noodles. Hi. This looks good! Do the zucchini noodles hold up for 4 days? Hi Leslie! Since we don’t cook them, they are cooked for the first time when you heat it up in the microwave. So they do keep for 4 days! i would also love to know the calories on this! looks amazing i know my husband will love it! Hi Victoria! I’ve just updated the post with the nutritional information! Just made this for meal prep this week and so excited about it! So is my husband haha! 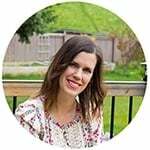 Wondering if you have the calorie/nutrition fact sheet information on this recipe? Thanks! Love everything you do! Oh that’s so weird! I somehow missed adding it to the recipe card. Will update ASAP. Hope you enjoy! Hi! This recipe looks wonderful. I looks forward to trying it soon and coming back to rate it. I love prepping my work lunches each week. Quick question: The recipe reads, “3/4 cup basmati rice uncooked”. Should it be “3/4 cup basmati rice cooked” instead? Hi Paula! Yes, it is supposed to say ‘uncooked basmati rice’. I always include cooking the rice in the directions and cook time for my recipes. From 3/4 cup of uncooked rice you should get close to 2 cups of cooked rice, working out to around 1/2 cooked rice per portion. Hope you enjoy! I’ve just updated the recipe card to include cooking the rice!